Microsoft has made mistakes. It knows this. But as the company proved today at its Windows 10 HOLOGRAPHIC GOGGLES launch event, it's also not going to stop pushing user interface design into the future. It's just getting smarter about it. It's been a long road for Windows users. Microsoft's flawed product releases often conform to a pattern, as many before me have pointed out: A batch of poorly-received changes, followed up by a more stable release that calms everyone down. Think about the hot pile of garbage that was Vista—corrected by Windows 7. Then came another great leap forward that was hailed by consumers as a disaster, Windows 8. 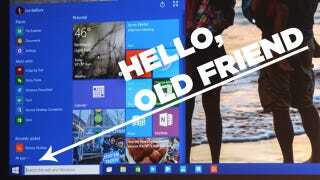 Windows 10 could be perceived as a step back from Windows 8, a regression from the utter rage it faced after the release of its radical new OS in 2012. It's not. Windows 10 is a smarter, more subtle, and more complete version of what Windows 8 attempted: A single OS that functions on any damn screen you choose to run it on. There are two important features we saw demo'd today, and they're both about consistency. With Windows 8, Microsoft decided to—for some reason—design a new Windows experience for touchscreen devices and then transplant that interface onto your desktop. It's unclear what logic played into that decision, but it's clear now that it was at least a partial mistake. With Windows 10, Microsoft's team reversed that rationale by making the skeleton of the conventional Windows experience the same across every device—and it's doing it with a very cool feature called Continuum. Think of it as the connective tissue between a touchscreen UI and a mouse-based UI. Continuum knows whether you're using your device with a mouse and keyboard, or with your big fat fingers, and it adjusts the interface to fit whichever hardware mode you're in. Continuum goes hand-in-hand with Microsoft's Windows 10's apps, which will look and act on your phone just as they do on your computer. If it works, it's going to be an incredible achievement for cross-device software development. That's right: The way you ignore emails on your PC will be the same as the way you ignore emails on your phone. And what about the other big UI news of the day—the Cortana is coming to Windows 10, and will be integral to the user experience? 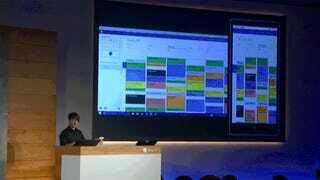 That, too, is a push towards making the way you use Windows on your PC just like the way you use it on your phone. Think about it: Your fingers and your mouse differ wildly in terms of interaction design. But the hardware and software used for voice recognition is the same across all devices. In that sense, Cortana is the answer to all of Microsoft's woes—a universal interaction paradigm that's always the same, no matter where she's talking to a user. So we've got two very powerful new tools: Continuum, which knows how you're using Windows, and Cortana, who doesn't care, because she works the same way every time. If all of this hubub—the new name, the new features, the entirely new OS—is really just a smarter version of Windows 8, then why did Windows 8 fail so badly? And shouldn't we be concerned that Windows 10 will fail in the same way? Windows 8 was, as Kyle Wagner put it at the time, the biggest change in Microsoft's user interface since the early 1990s. The OS itself wasn't all bad. In fact, if you took the time to accept change into your life, it was rewarding. But user reactions were swift and they were brutal, focusing on a seemingly innocuous change within the OS—the fact that the start button and menu had been replaced entirely with a bevy of colorful squares, devoid of context or clues. In design parlance, Microsoft had axed one of Windows' most important affordances. Affordances, as we've discussed before, are clues that show users what's possible within an environment. In the physical world, an affordance is a door handle that shows you a door can be opened. In the digital world, an affordance is usually an element like a slider or knob—a design detail that helps us figure out what an icon or element is capable of doing. The start menu was Window's ultimate affordance. It showed us where to open the doors. No matter how the OS changed, no matter what else about Microsoft did, that menu would be there to help users navigate. Until it wasn't. And that was the biggest little problem with Windows 8: It was a smart idea, completely devoid of human-centered design. In the race to build an operating system that would be universal to every device, Microsoft built one that was foreign to the humans using them. The current users were tossed aside for the theoretical users of the future. 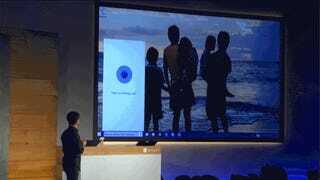 And so Microsoft is giving the people what they want—nay, what they deserve: A damn start button and menu. Those comfortable affordances are here to stay, and Microsoft seems to be learning a basic lesson: That progress doesn't necessarily mean tossing out the old and familiar, but slowly and surely adding to it until, almost unnoticed, the future arrives.